In 2015, State’s Attorney Mosby reconfigured and expanded the Conviction Integrity Unit (CIU), charging the division with investigating claims of actual innocence and wrongful convictions. Today, CIU is the only Conviction Integrity Unit in the state and is led by a division chief, and staffed by four Assistant State’s Attorneys (ASA) and two law clerks. In 2018, CIU expanded to include a new, grant-funded investigator dedicated to investigating the claims of actual innocence and wrongful conviction. The federal grant was received in partnership with the Mid-Atlantic Innocence Project and the University of Baltimore’s Innocence Project Clinic. In addition to investigating claims of actual innocence and wrongful conviction, CIU ensures the integrity of convictions by handling a variety of collateral matters including petitions for expungement, modification motions, habeas petitions and other post-sentencing matters. CIU also reviews all Maryland Public Information Act (MPIA) requests from incarcerated individuals, which includes approximately 300 requests a year. In May 2016, CIU successfully exonerated Malcolm Bryant for the murder of 16-year-old Toni Bullock. Bryant spent 17 years behind bars after he was wrongfully convicted in 1999 of second-degree murder. In September 2017, CIU exonerated Lamar Johnson who spent nearly 14 years behind bars for the first-degree murder of Carlos Sawyer shot in 2005. The subsequent re-investigation of the case began in 2016, and resulted in several independent witnesses confirming that Johnson was not the shooter. In July 2018, CIU and its partners united to exonerate Jerome Johnson, the third person in three and a half years. Mr. Johnson was released from prison after serving nearly 30 years in prison for the 1988 murder of Aaron Taylor shot to death at the Night Owl Bar. In December 2018, CIU collaborated with the University of Baltimore Innocence Project clinic exonerated Clarence Shipley after serving 27 years in prison for a murder he did not commit. Mr. Shipley was wrongfully convicted for the murder of Kevin Smith in 1991. 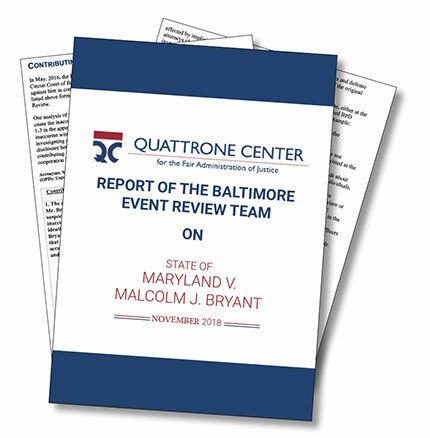 The SAO partnered with the University of Pennsylvania Law School’s Quattrone Center for the Fair Administration of Justice, the University of Baltimore Innocence Project Clinic and other partners to release a root cause analysis report, also known as the Baltimore Event Review Team (BERT) report. The report examines the case of Malcolm J. Bryant who was wrongfully convicted of murder in 1999 and provides recommendations on how the criminal justice system can decrease the occurrence of wrongful convictions. The report also specifically focuses on various components of the investigative, trial, and post-conviction phases of Bryant’s case. Recommendations included best practices for investigating and charging single witness identification cases, sharing discovery and evidence between the SAO and BPD, and developing an objective team within the SAO to review claims of innocence. Lauren Lipscomb is the Chief of the Conviction Integrity Unit where she has vigorously pursued enforcement of probation orders on cases involving violent repeat offenders and special victim offenders. The Conviction Integrity Unit handles a variety of collateral matters including enforcement of violations of probation, post convictions, modification motions, habeas petitions and other post sentencing matters. The unit also investigates post sentencing matters relating to DNA evidence and investigates claims of wrongful conviction. Lauren joined the State’s Attorney’s Office in 2003 and was sworn in as an ASA in 2005 and began her career in the District Court. She currently serves on the Peer Review Committee for the Attorney Grievance.